The state of North Carolina works in conjunction with major industries and training programs to ensure that companies have the skilled workers they need to fill important jobs. North Carolina’s career and technical education, also called CTE, allows students to gain the knowledge skills employers are looking for within a few years of study. This page outlines vocational and trade school education in North Carolina along with information on top careers for vocational and trade students. 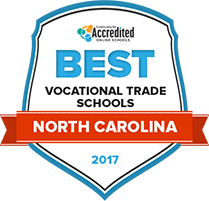 The vocational and trade school opportunities available to those in North Carolina can be found in the following rankings. Many students choose to enroll in a community college, career college or vocational institution in order to study in an allied health field or construction trade - two fast-growing industries in North Carolina. To help students make the best choice, our rankings include factors that matter most, such as tuition rate, length of programs and financial aid availability. Asheville-Buncombe Technical Community College has six campuses located North of Fletcher to Marshall. Two-year degree programs are taught in allied health, emergency services and applied technology. Classroom, theory and hands-on or laboratory instruction are all part of the school's vocational training programs. Fields that graduates could work in are criminal justice, nursing, construction, welding and civil engineering. Registration for degree programs must be completed by deadline. An academic learning center, writing center, tutoring, academic advising and computer labs are all resources students can take advantage of. Moodle, WebAdvisor, student email and InfoBase are online services that are also open to students. Located in Marion, North Carolina, McDowell Technical Community College offers Associate of Applied Science degrees in automotive systems technology, nursing, cosmetology, industrial systems, electrical systems, web technology and general occupational technology vocational specialties. Its small business center provides counseling, trade journals, magazines and pamphlets to area entrepreneurs, including graduates of its vocational degree programs who go on to start a business. Applications are accepted in person at the Student Services Office. Placement tests are also taken on campus. New students are encouraged to meet with an adviser to plan their course schedule. Pitt Community College offers associate of applied science degrees in various vocational fields, such as air conditioning, heating and refrigeration technology, industrial management technology, industrial systems technology, mechanical engineering, welding, office administration and nursing. The school also offers select continuing education courses to help prepare students for licensing and/or certification requirements. Work based learning is a way that students can use their work experience to earn academic credits. For 160 hours of work experience, qualifying students can earn one semester hour credit. Maximum credits that students can earn each semester are two. Regardless of the program that they major in, all freshmen are required to attend new student orientation. Through its two-year vocational programs, Fayetteville Technical Community College prepares students to work in fields like the culinary arts, global logistics and distribution, healthcare management, HVAC, automotive, hospitality and business. Classes are taught at the Spring Lake Campus and at the Fort Bragg Center. High School Connections is part of the state's Career and College Promise program. Through this program, high school students take college courses alongside their required secondary curriculum. The Student Learning Center, Children's Center for students who are parents, student advising and university outreach are services that students can take advantage of. Graduates can search for relevant jobs using the school's online job board. Early and traditional registration is offered at Guilford Technical Community College. Created in 1958, the college accepts applications via an open admissions policy at each of its four campuses. Construction management technology, culinary arts, entertainment technology, electronics engineering and nursing are just a few examples of the associate degree programs offered at this community college. The college has a co-enrollment engineering program agreement with North Carolina AT&T State University. Through the agreement, all credits in Guilford Technical Community College's engineering program transfer into North Carolina AT&T State University's four-year degree program. North Carolina has made a commitment to providing quality vocational education to residents. Between 2013 and 2015, Governor Pat McCrory made budget recommendations that would provide an additional $32 million to community colleges sponsoring programs in technology training and engineering. Governor McCrory recommended $28 million be allocated to equipment and infrastructure for the state’s community college system over the following few years. There are several vocational school choices in North Carolina for students to choose from. Use the search tool below to find the best vocational and trade schools in North Carolina. 94 percent of vocational and trade high school students in North Carolina graduated in 2013. There are seven public high schools in the state dedicated solely to delivering vocational education. In addition to post-secondary education, vocational and trade education is provided to students in North Carolina through comprehensive high schools, vocational high schools, career academies and STEM education schools. According to the U.S. Department of Education, in the 2013-2014 school year, there were 526,263 secondary and 134,181 postsecondary students enrolled in vocational and trade programs in North Carolina. Students in North Carolina who want to be trained for vocational positions can enroll in certificate programs that take one year or less to complete, as well as two-year associate’s degrees. Thanks to recent state legislation, it’s become much easier for high school students to work towards an associate degree, which helps to speed up the time it takes to train for a career. For example, the Huskins Bill allows secondary students to take community college courses right on their high school campuses, and concurrent enrollment programs make it possible for secondary students to earn credits that are applied to both their high school diploma and a college degree. The table below provides a look at the certifications and degrees that are earned by students in North Carolina and compares those numbers to national data. Health-related positions are a growing industry in North Carolina like much of the nation. Popular careers among vocational and trade students include nursing assistant, registered nurse, medical assistant and dental hygienist jobs. With 100 community hospitals, six research hospitals, four acclaimed medical schools and private companies like Novo Nordisk, Pfizer and LabCorp, North Carolina’s vocational students can use their training in any number of healthcare settings. Other popular industries for vocational graduates in North Carolina include legal and education. The table below outlines the number of jobs available to vocational and trade school graduates, the anticipated growth for these positions and the average salary of each position. Wake Technical Community College in Raleigh offers a wealth of vocational and trade options for students. Popular areas of study include business (662 students enrolled), computer and information science (244 students enrolled) and liberal arts and sciences (764 students enrolled). Students who graduate with a credential in one of the school’s computer and information science programs can find employment in the city’s thriving technology sector, which includes companies that make defense technologies, computer hardware and interactive software products. Raleigh is known for its growing healthcare industry and the majority of large biotechnology companies in the state are located in Raleigh's Research Triangle Region, including pharmaceutical, agricultural biotechnology and advanced medical technology companies. Miller-Motte College-Raleigh, offers vocational and trade programs qualifying students to work in healthcare, including phlebotomy technician, medical/clinical assisting and nursing assistant certification programs. Includes economic impact and workforce information for some of North Carolina’s biggest industries, including the textile and apparel, aerospace and aviation and military sectors. Online resource for North Carolina residents to explore careers, search job posting, and learn about the labor market and occupation profiles. This organization provides assistance to the educators who deliver career and technical education to North Carolina’s vocational students. The North Carolina Department of Labor’s site includes information on industries in the state, occupational safety and employee wage laws. Post resumes, search jobs, and tap into employment resources. Provides information on the state’s top industries, including data on employment, wages and exports.